A sharp increase in food and energy prices pushed the Producer Price Index up further in February—its eighth consecutive rise. The Bureau of Labor Statistics release of the Producer Price Index (PPI) indicates that the PPI for finished goods jumped 1.6% in February (SA), driven by a 3.9% increase in finished consumer foods and a 3.3% rise in finished energy goods. The index for finished goods less food and energy was up a modest 0.2%. Over the past 12 months, the price of finished goods has advanced 5.6% (NSA). Food and energy prices have been the main contributor to the strong growth in the overall PPI for finished goods (+4.4% NSA) over past the eight months. Since June 2010, the price index for finished energy goods has risen 8.8% and the index for finished consumer foods is up 8.1%. The index for finished goods less food and energy has increased a more modest 1.7% over this period. The price index for inputs into residential construction was up 1.0% in February. This was led by increases in prices of energy intensive products such steel (+4.7%), copper (+3.9%), insulation materials (+3.5%) and asphalt products (roofing and siding 0.6%, paving 0.9%). The index also includes petroleum products, #2 diesel fuel (+7.1%) and regular gasoline (+2.8%). Most other building materials experienced a modest decline—cement (-0.7%), gypsum products (-0.7%), ceramic tiles (-0.5%), brick and clay tiles (-0.4%) and lumber (-0.4%). Year-over year, the price index for residential construction is up 5.1%. It is important to note that the increases observed are due to strong global demand, rather than the abysmal conditions currently in the US housing market. The earthquake in Japan has yet to impact commodity prices. Japan is a large global importer of building materials, particularly wood products, steel and concrete, so upward pressure on prices of these products can be expected as the rebuilding in Japan gets underway. Overall, we expect PPI increases to slow substantially through 2011. The spike in oil prices is expected to be short lived, as it is due to uncertainty surrounding the political turmoil in North Africa and the Middle East, rather than prolonged disruption in supply. 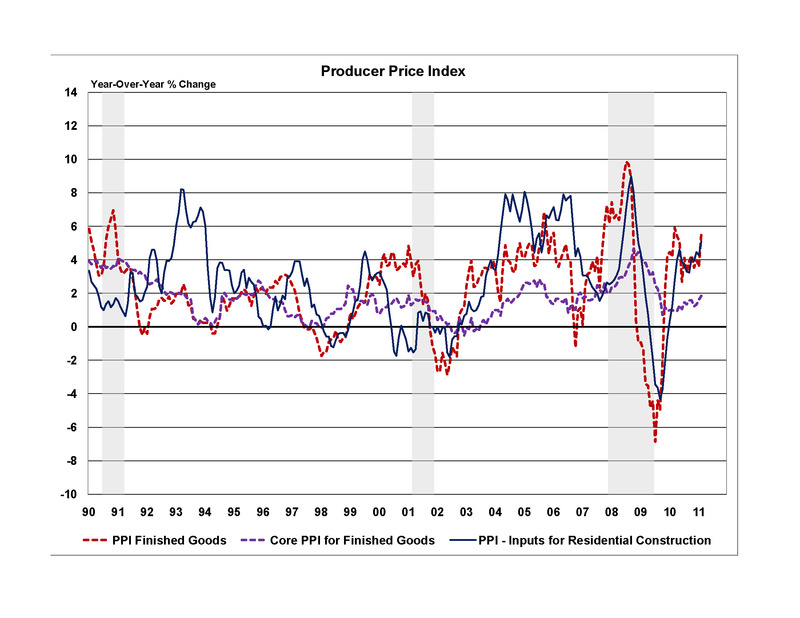 The price index for residential construction generally follows movements in the broader PPI for finished goods and we expect that to continue through 2011.